Hand tied bridal bouquets can be designed in several different ways. Experienced florist usually hold in one hand and cross the stems at a 45 degree angle as she turns the bouquet is one method. The bouquet can become a little unwieldy and hard to manage if you have smaller hands. Another method (which I highly recommend) is creating a "mock hand tie". This means it LOOKS like a hand tied bouquet, but it is actually created on a bouquet holder. I create most of my bouquets in this manner because it gives those flowers the all important water source. This bouquet is also an easy way to create the beautiful look that brides crave. You'll need a garden vase. This means a vase that is shaped like an urn and flares out in the top. Although I used only alstroemeria in this bouquet tutorial, you can mix in different stems if you wish. One word of advice - if you are creating several attendant bouquets, I suggest you line up the vases and insert all the same flowers at the same time, step by step. This allows you to mimic and duplicate the same look in all the bouquets. It's easier to get unintentionally bigger or smaller (or even forget a flower!) when working on one bouquet at a time. Going down a table as in a production line is faster and doesn't allow you to "run out of flowers" before you are finished since you are equally distributing the flowers between all the bouquets at once. 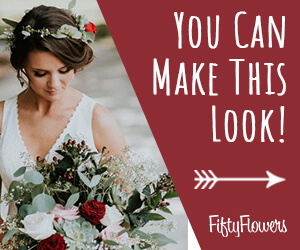 I suggest you do the bride's bouquet first, because you want to choose the most perfect looking flowers for her bouquet before doing the attendant's bouquets.